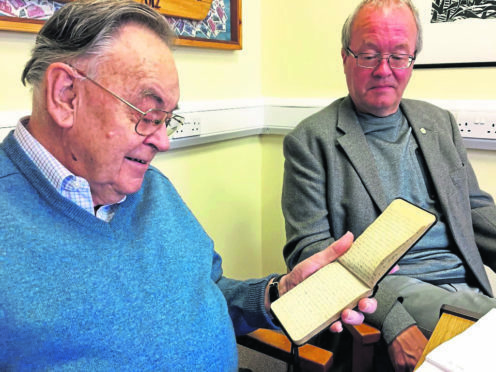 Author Graham Johnston (R) and Charles Lindsay Abernethy with the original diary his father carried in the trenches. Guns and shells, bombs and mortar weren’t the only perils faced by soldiers during the First World War. There was also the spectre of gas, which the poets of the period described as the “secret enemy”; a weapon that crept up on its victims and suffocated the life out of them. The toll it took will be recounted as the first of four books about Shetland’s role in the conflict is launched next week, highlighting the fashion in which families were torn apart during the hostilities. In 1916, Shetland brothers Charlie and Willie Abernethy served together in the trenches at the Somme in the Special Brigade, which waged gas war against the Germans. Willie perished at the ill-fated site, aged just 23, and his brother recorded the awful circumstances of his demise in his trench diary on the day it happened. More than a century later, their experiences have been chronicled in The Gas War by Graham Johnston. The poignant story of the Abernethy brothers was one that caught Mr Johnston’s attention because very little has been written about the British efforts during the gas war. He was also able to consult with Charlie’s son, Charles Lindsay Abernethy, who visited Shetland with the original diary to meet the author. Mr Johnston said “Personal testimony is one of the best ways of illuminating history. Shetland Library manager Karen Fraser believes the project has already surpassed expectations. She said: “Shetlanders are very interested in our war history and this ongoing work by volunteer researchers and museum and archive staff is really increasing our appreciation of how it affected our community. “We are publishing history books which are short, accessible, cheap to buy and will also be freely available in libraries across Scotland. The other books due to be published as part of the Shetland’s War initiative are Shetland Merchant Mariners in the Great War by J Laughton Johnston and That Grim Red Dawn – Shetland’s sacrifice at the Ancre by Jon Sandison, together with And Darkness Fell, a novel by Christian Tait. The Gas War launch is at Shetland Museum and Archives at 7.30pm on Friday August 24. It will feature talks by Charles Lindsay Abernethy and Angus Johnson.